The Center of Restorative Exercise uses the most effective adapted exercise equipment for the training of their members. The Bravo Functional Training system is a truly innovative approach to functional training. The system combines unique technologies and the best aspects of selectorized and cable-based strength training equipment to offer simple, safe operation, expanded functionality and better results. Total Access is a line designed to be accessible to the physically impaired but which does not exclude other exercisers. This allows fitness enthusiasts who have physical or sensory limitations to take advantage of fitness training on the same gym floor and using the same equipment as those who do not. Swing away seat with locking plunger adjustment allows easy access for wheelchair users and one-handed seat adjustment for users with limited mobility. The NuStep is a unique piece of cardiovascular exercise equipment which allows for people with paraplegia or hemiplegia to get a great cardio workout safely and effectively. ground-based training. The seat can be removed to allow for a wheelchair to be used in place of the chair. The independent crank arms for greater variety of movement to keep users engaged. Narrow crank axis allows for higher RPMs, increasing speed and endurance. Ergonomically designed saddle allows easy transition between seated and standing exercise positions. Crank and flywheel assembly rotates to accommodate forward and reverse movements. Adjustable crank arm height encourages greater range of muscle activation. It is wheelchair accessible when the seat is removed. The EasyStand Glider provides the user with state-of-the-art active standing technology that can be found in no other standing frame. Active standing provides lower body range of motion and upper body strengthening. 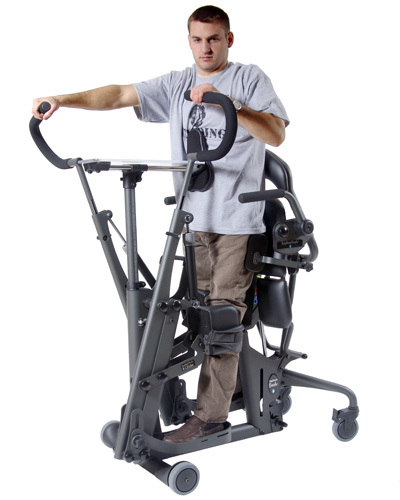 Unlike passive standers, the active standing Glider allows users to move the handles with their arms (or a caregiver can assist) which creates a reciprocal movement in the legs. The full range seat has hinged, break-away sections for each leg that allow full leg extension while standing. It’s easy to customize the Glider for individuals of various heights and abilities for use in a rehab setting. The adjustable resistance cylinders are accessible to the user while in the standing position and the resistance is easily adjustable with twelve different settings. The seat depth, back angle, foot plate height, knee pad height, and handle height are also easily adjustable.